US music fans consumed twice as much rock music as pop music in 2014, according to new figures – but R&B/hip-hop was the most popular genre across streaming services like Spotify, YouTube and Rdio. 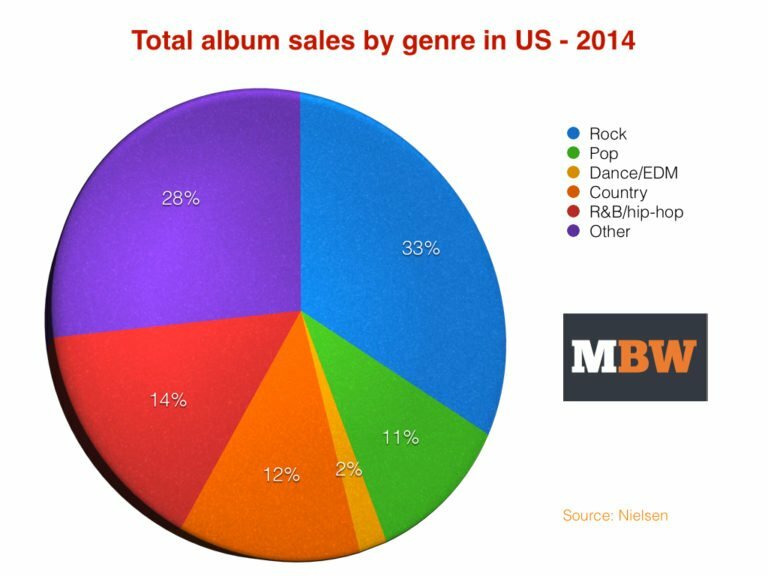 Data from Nielsen Music regarding the US market last year shows that rock music claimed 29% of total consumption across album and track purchases as well as streaming platforms. 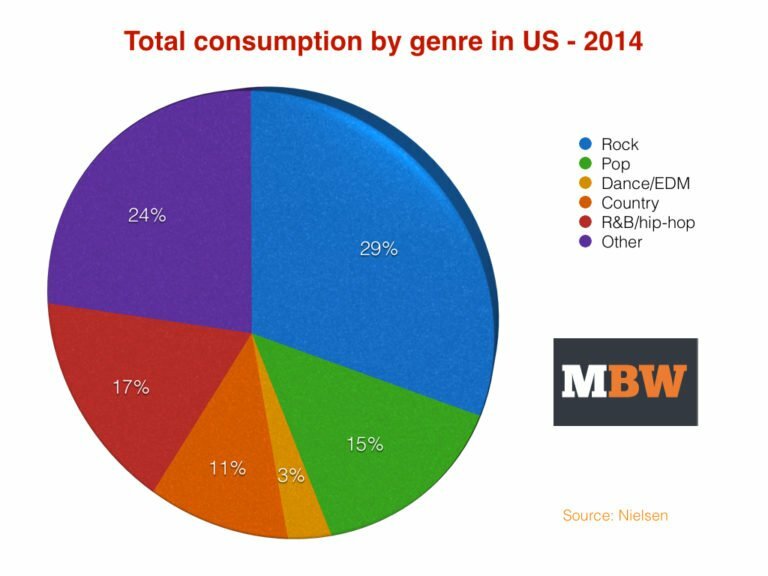 Pop was responsible 14.9% of consumption, with R&B/hip-hop taking 17.2% and dance music (‘EDM’) claiming 3.4%. Country music took 11.2% of the overall market, with Christian/Gospel on 3.1%, Latin music on 2.6%, Holiday/Seasonal (Christmas) on 2.6% and Classical and Jazz on 1.4% each. These percentages were calculated by dividing total track downloads into TEA (track equivalent albums) and total streams into SEA (streaming equivalent albums)* and then adding the results to the album sales tally. Using this formula, overall annual music consumption was down year-on-year in the US by 2% to 476.5m ‘albums’ in 2014, according to Nielsen. It is worth pointing out that ‘Rock’ in Billboard/Nielsen’s eyes is quite a far-reaching term; in 2014, as well more straightforward Rock ‘acts’ such as AC-DC, Nickelback and The Foo Fighters, it was applied to big releases from the likes of Coldplay, alt-J, and Hozier as well as the 900k-selling Guardians Of The Galaxy soundtrack. In pure album sales terms, Rock music was hugely dominant in 2014, taking 33.2% of the market ahead of R&B/Hip-hop’s 13.9%. Pop albums, with 10.8% of all sales, made up just a third of Rock’s sales and were even trumped even by Country music, which claimed 11.8%. Dance music/EDM was responsible for just 2% of all album sales, behind ‘Holiday/Seasonal’ (aka Christmas albums) with 3.6% – the same share as Christian/Gospel music. Children’s albums took a 1.5% market share, with Classical claiming 2.1%, Jazz taking 2% and Latin music taking 2.4%. Pop was even pipped by rock music in its more natural domain, the single-track download. Rock was once again the No.1 genre here in 2014, with 21.3% of sales compared to pop’s 21.2% share. 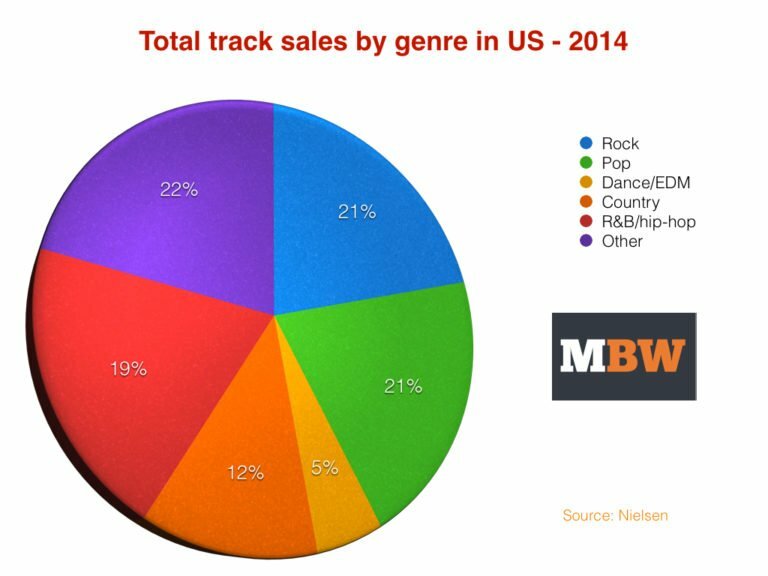 R&B/hip-hop was a close third, with 19.1% of the market, while country claimed 12% and dance music/’EDM’ took 4.6%. Christian/Gospel took 2.8% of the single track market, with Latin music on 1.8%, Holiday/Seasonal (Christmas) on 0.9%, Jazz on 0.6%, Classical on 0.5% and Children’s on 0.3%. 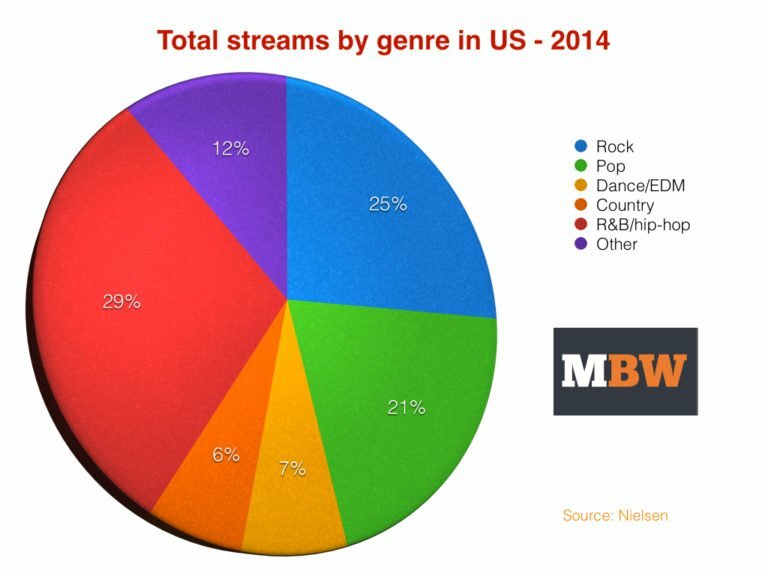 Dividing US 2014 music consumption by genre in terms of streaming makes for some very interesting results: R&B/hip-hop music was the leading genre with 28.5% of all streaming consumption in the year. Nielsen’s data takes into account streaming from AOL, Beats Music, Cricket (Muve), Google Play, Medianet, RDio, Rhapsody, Slacker, Spotify, Xbox Music and YouTube/Vevo. Rock music was the second most popular streaming genre with 24.7% while Pop claimed 21.1%. Dance music/’EDM’ took a bigger share than any other format, with 6.8%, while Country laid claim to 6.4%. Latin music did particularly well on streaming services, taking 5% of total consumption, compared to 1.8% of tracks and 2.4% of albums. Christian/Gospel music took 1.6% of all streams, with Holiday/Seasonal on 1.1%. Jazz, Classical and Children’s genres all took less than 0.5% each. * Nielsen’s formula for an SEA (Streaming Equivalent Album): 1,500 streams = one album sale; for a TEA (Track Equivalent Album): 100 sales = one album. * ‘Other’ in the above charts refers to a combination of Children’s, Christian/Gospel, Classical, Holiday/Seasonal, Jazz and Latin in addition to less popular genres.